From the New York Times best-selling author/website Cheezburger Network, a hilarious compilation of over 100 photos featuring the heights of male incompetence and showcasing the feats, follies, foibles, and questionable DIY activities of men at work in the home, the office, and just about anywhere.Men at Work showcases dozens of original full-color photos based on the popular websites There, I Fixed It and FAIL Blog, two of the most trafficked Cheezburger sites. From precarious ladder placement and jungle gym scaffolding to questionable balancing of two-ton mechanical equipment, Men at Work dares to offer a possible reason for why women live longer than men. 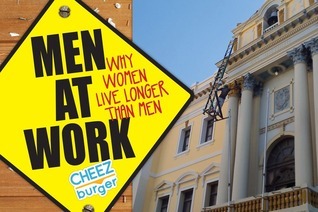 Men At Work is a compilation of funny pictures that are paired with sayings. Of course all of the pictures revolve around men and all the stupid things they do… that they actually think are great ideas. You have ladders on top of vehicles in order to reach the roof of a house, a hair drier to thaw (or maybe cook) a turkey, a rubberband around the head for a hands-free phone, and the list goes on. I have to be honest though, not all of the pictures show stupidity at it’s finest, some of these ideas and inventions are pretty imaginative and cool. If you’re looking for something to flip though and maybe get a few chuckles out of, then pick this up. It’s made by the same people who do I Can Has Cheezburger? But with that being said, it’s nothing that you can’t find browsing the internet or the Cheezeburger website. I love browsing their website and others like it to look at some of the funny things people do. 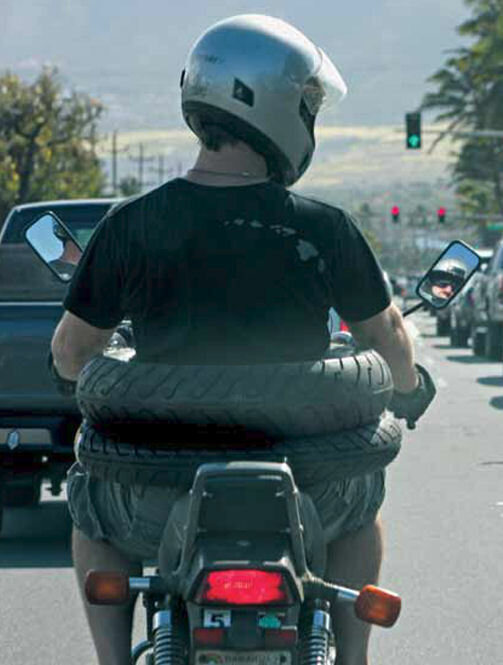 Like for instance, this guy’s idea of protective bike wear. Oh I love ones like this Kristin! They’re too funny and I always end up laughing until I cry. Hopefully this’ll show up at the used store I work in some day 🙂 Wouldn’t mind flipping through it.